If you are a tomato lover like me, I have two very simple salads that probably everybody else is making them at this point anyway, but I had these pictures on my computer for a while now and I love the colors so I thought I should share them. Pretty cool, eh? As always, you don’t have to follow my recipes to the letter, just use your imagination and taste, tomatoes are so versatile as a fruit, they pretty much go well with anything. First one is a simple mix of Campari tomatoes which I really love (pretty much that’s the only kind I use), radishes, red onions, feta cheese and loads of basil. Quantities don’t make a ton of sense here since there are none, the more tomatoes the merrier. However, do not forget the good old virgin olive oil, pretty much the only requirement here. And forget about the bread, I only used it for composition lol. 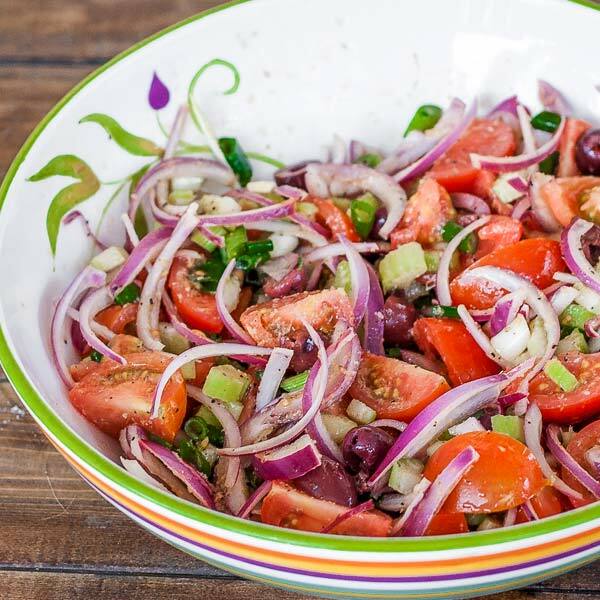 Moving on to door number two, another winner here, again with Campari tomatoes, red onions which are really easy on your stomach compared to the normal ones, green onions, a stalk of celery (or whatever is called), green hot peppers (the little mean ones) and loads of oregano. For quantities, you decide how much you want from each ingredient but if you are really confused then leave a comment with your question and I’ll walk you through it. Don’t forget virgin olive oil and this time balsamic vinegar. You could throw in a little bit of sugar too if is to acid for you but make sure you dissolve it first. Here you go, not much but the simplest things are usually the most delicious and after these two recipes you will be one step closer to becoming a vegetarian. For myself, I only want to say, thank God summer is coming along with lots of fresh veggies… and I can BBQ again. Enjoy! Salad is pretty easy to make, no special instructions are required. Just clean, chop and mince all your veggies and toss everything in a large bowl with olive oil and vinegar. Servings might be more than 4, I usually eat loads of tomatoes. LMK what you think. Enjoy! 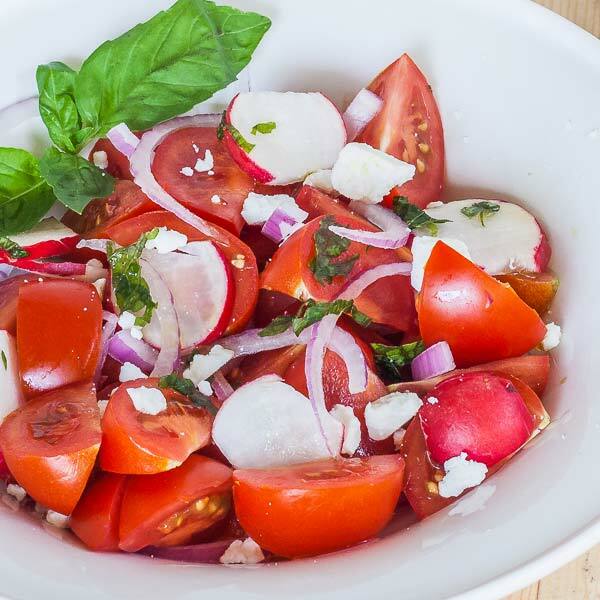 Top recipe is more simple, use radishes, red onions, feta cheese and loads of basil with a generous quantity of virgin olive oil.